Do not take a loose tooth for granted. Learn how to save your teeth. As a child you might have gotten excited each time you spotted a loose tooth, as each one meant money under your pillow and the emergence of permanent dentition. However, as an adult, loose teeth are a cause of great concern, for aesthetic reasons and because a mobile tooth will mean more work for your remaining teeth. Here is everything you need to know about loose teeth, including treatment and preventive measures. What Keeps Your Teeth In Place? Your tooth is composed of a hard layer of enamel, slightly weaker dentin, the cementum covering the root and the innermost layer, pulp, filled with nerve endings. The tooth resides in its socket, embedded in the alveolar bone. However, there are supporting structures that keep it in place. The gingiva or gums cover the bone and enclose the tooth. The periodontal ligaments serve as an elastic cushion, found between the tooth and the alveolar socket. These structures serve as the bond that keeps the teeth in place. Please note that the periodontal ligaments are minuscule fibers that provide your teeth with a cushion, to absorb the forces caused by chewing. Since it is elastic, keep in mind that a certain amount of tooth mobility is considered normal. Therefore, your teeth move a bit each time you chew. However, this movement is hardly visible. If you notice that your tooth is more mobile than normal, that is a cause for concern. There are many factors that contribute to loose teeth. Accidental trauma or blunt force to the area may result in tooth mobility. Falling face forward, getting hit by a ball and car accidents account for a major percentage of accidental trauma that results in loose teeth. Occlusal trauma, also called bite injury may be another factor. This happens when a tooth receives more force during a bite than it can handle. Some habits like Bruxism (night grinding) and tooth clenching can cause occlusal trauma. A gum abscess or tumor may also cause loose teeth. Periodontal disease accounts for a major percentage of mobile teeth in adults. Please note that periodontitis is usually the cause, as gingivitis is more of a gum infection and thus, it may not damage the internal structures. Once the bacteria attacks the periodontal ligament and the alveolar bone, there is a definite cause for concern as there is a huge possibility that reattachment may not succeed. Periodontitis should be considered a severe condition. This may start out as a localized case. However, without proper intervention, it may spread to the other teeth. Periodontitis is caused by lack of sufficient oral hygiene, infrequent professional cleaning, smoking and diabetes. Common symptoms will include pain while chewing food along with red and inflamed gums. There are many ways to treat a loose tooth. However, to ensure the efficacy of the treatment, the procedure performed will depend on the causative factor. Therefore, treatment should be performed by a licensed dentist. It would be best to visit a periodontist, if the mobility is due to periodontal disease. If the tooth mobility is caused by accidental trauma, splinting should be done. During this process, the mobile teeth are attached to those that are anchored firmly. In most cases, resin composite is used. This tooth-colored gel is cured by a light-cure gun. The splint may be removed in two to three weeks, depending upon the severity of the condition. Bite injury can be treated with occlusal adjustment. This entails minor reshaping of the masticatory surfaces. It will also act as a preventive measure, with regard to periodontal disease, since the condition is linked to malocclusion. Please note that orthodontic treatment is necessary. By getting your teeth aligned properly, you can even out the occlusal forces, which prevents further trauma. Night guards are necessary for people who suffer from Bruxism, a condition wherein a person grinds his or her teeth at night. This is a psychological condition where a person who suffers from high levels of stress grinds and gnashes his or her teeth during rest. People who clench their teeth may not know that they have the problem, as they are in deep sleep when this occurs. However, the patient may complain of TMJ pains and the occlusal area of his or her teeth will look worn. Those who suffer from Bruxism need to wear a mouth guard at night to help his or her teeth recover. This device helps by absorbing the heightened masticatory forces. People with gum abscess or tumors should have them surgically removed as soon as possible. This may be done by a dentist or an oral; surgeon, depending on the severity of the situation. Those with periodontal disease should schedule an appointment for scaling and root planing. This procedure is done with the help of scalers and curettes. The dental practitioner may have to use a flap method, wherein the gums are separated from the tooth, in order to remove any deep seated tartar or calculus. Local anesthetic is given to prevent any pain or discomfort during the procedure. The patient is prescribed antibiotics as well. This will kill any of the remaining bacteria. As an added note, please remember that follow-up visits are required. Those with periodontal disease are asked to have their teeth cleaned every two to three months. If you play contact sports this should already be one piece of your protection. This will act as a precautionary apparatus and protect your teeth. Individuals with malocclusion should consider orthodontic treatment, before periodontal disease develops. People who night grind should seek out dental treatment, as soon as they spot symptoms of Bruxism, including TMJ pain. If the food you eat is very hard it may only further loosen your teeth. Therefore, it is important to be aware of what you are eating. Plan ahead, before you put it in your mouth! And chew carefully! Brush: Brush twice or three times daily. Floss: Floss between each tooth, preferably with the use of waxed dental floss to avoid accidental trauma. Water picks can also be used if you find it hard to floss, especially for individuals with fixed orthodontic appliances, like braces. See your dentist: Bi-annual dental visits for professional oral prophylaxis/ plaque removal are necessary. Each time you skip a dental appointment, you are putting yourself at a great risk. 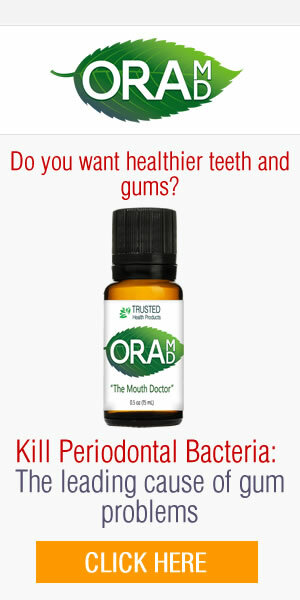 Studies show that oral conditions can affect your overall health. Periodontitis is a serious condition that can lead to disfigurement. Therefore, if you have had periodontal diseases in the past, it would be wise to take better care of your oral health. Please remember that once the internal structures become infected, you will require extensive procedures, which are definitely costly. That is why it is best to invest in the time and care of your gums. Oral health is important, and not just for aesthetic reasons. The health of your oral cavity can affect your quality of life as well. Loose teeth in children are adorable. However, an adult with missing teeth is an eyesore. Thus, it would be wise to take extra pains to ensure that your teeth stay firmly attached to your alveolar bone. Remember that it is cheaper to invest in a soft-bristled toothbrush, a natural toothpaste and dental floss than it is to have a full set of complete dentures made. 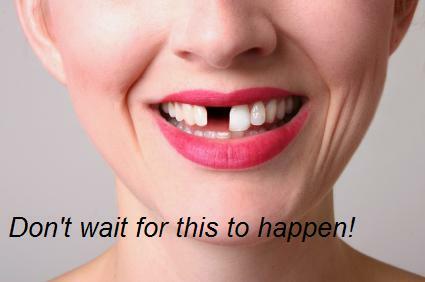 Therefore, if you notice that you have loose teeth, schedule a visit with your dentist right away. Remember, teeth need healthy gums. Learn more about how to strengthen your gums.